CES 2018: SAMSUNG Flip WM55H digital flip chart display announced. Samsung Electronics today offered CES 2018 attendees a first look of its new Samsung Flip WM55H digital flip chart display. 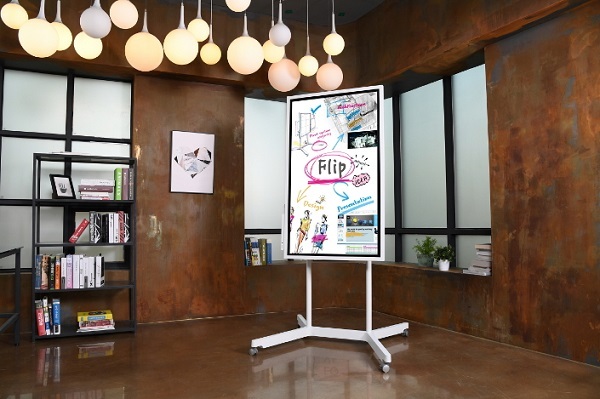 Introduced at the company's First Look event, the Samsung Flip promotes more collaborative digital engagement by alleviating the most prominent challenges businesses face when organizing, facilitating and recapping meetings. An upgrade on both standard paper flip charts and analog boards, the Samsung Flip display expands opportunities to generate game-changing ideas while maintaining the familiar feel of traditional writing. However, unlike its predecessors, Samsung Flip allows easy sharing, annotation, movement and even searching, as well as the ability for multiple users to create content at once. Additionally, the Flip's portable, wheel-based stand transforms any location into a huddle room, meaning added flexibility to businesses with limited conference space. Finally, the Flip display's intuitive interface was specifically designed to be user-friendly and allow for timely, uninterrupted conversation. For added interactivity, the Samsung Flip display also offers extensive device compatibility through both wireless connectivity and USB, PC and mobile ports. An integrated screen-sharing functionality makes Flip content available on connected PCs, smartphones and tablets without interruption or reduced visual quality. Likewise, users also can import personally-stored content onto the Flip display's screen and introduce fresh ideas to the discussion. Each Flip display is customizable and can configure to portrait or landscape orientations to suit unique meeting needs. When coupled with its height-adjustable stand, the Flip also maximizes available writing space at users' preferred positions. Should a meeting require more centralized, roundtable-style discussion, users can remove and connect the Flip display to a compatible wall mount.